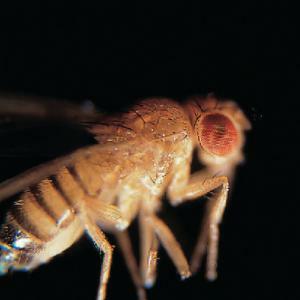 Drosophila melanogaster, the common fruit fly, is widely used in genetic studies because they express a number of mutations such as eye, wing, and body mutations. 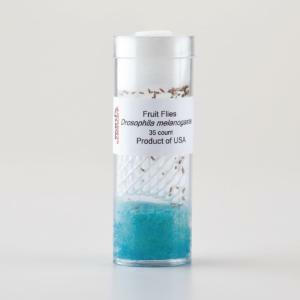 Drosophila demonstrates complete metamorphosis with egg, larva, pupa, and adult stages in its life cycle. Delivery information: These products contain living or perishable materials and must ship via overnight or 2-day transit. Please specify a delivery date at checkout. Wild type exhibit normal genetic characteristics (red eyes and normal wing size). Allow cultures to come to room temperature before checking under low magnification for eggs and live larvae. Packaging: Cultures are shipped with Drosophila medium in a shatterproof vial. The pupae will usually appear within ten days of the ship date.